Joe’s career in the “theme” restaurant business spans over 35 years and includes experience in such popular national chain restaurants as TGI Friday’s, Bennigan’s, Applebee’s and Cheese Cake Factory. Most recently, Joe served as Managing Partner and Owner of the Ruby Tuesday restaurants in both Utah and Idaho. During his career, Joe has opened over 100 separate restaurants in 16 states and served in a number of capacities including Director of Operations, General Manager, Regional Manager and Chief Executive Officer. Joe is fully knowledgeable of the specifications and operations for a wide variety of restaurant concepts and specializes in multi-unit operations. 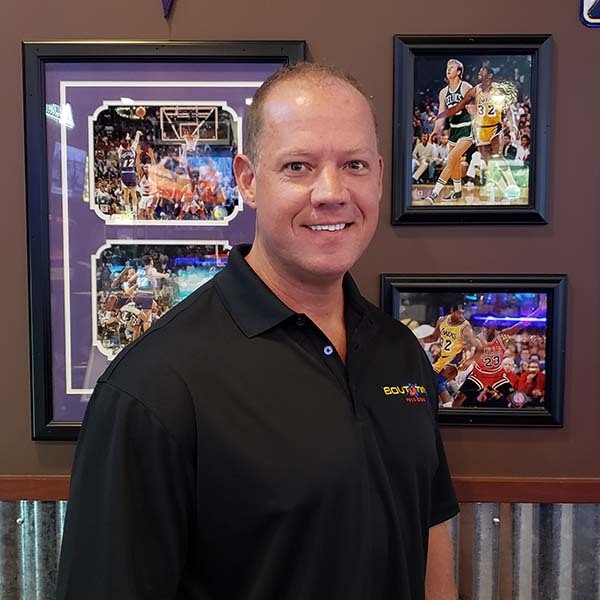 As President and CEO of Ruby Tuesday Utah franchises, Joe owned and operated six (6) restaurants in Utah and captured three (3) national operations contest titles. Prior to his involvement with Ruby Tuesday, Joe served as Director of Operations for TGI Friday’s. In that role, Joe returned 30 failing locations to profitability and success through training, marketing and expense management. Paula began her career in the food service industry as Shift Manager for Pizza Hut in 1989. Later, Paula was both a Bar Manager and Front-End Manager for Bennigan’s restaurants from 1989 until 1993. Thereafter, she moved to Applebee’s as Shift Manager, where she served until 1995. Following her work with Applebee’s, Paula assisted her husband, Joe, in the development and operations of the Ruby Tuesday Utah franchises until Joe and Paula developed the Bout Time Pub & Grub concept. In his capacity as CFO, Tim is focused on matters related to finances, accounting and brand expansion. Tim brings to the Company a wealth of knowledge and experience in business, finance and restaurant management that he has gained over the past 26 years. In 1986, he graduated from Johnson and Wales University with an Associate Degree in Hotel and Restaurant Management. Tim then attended and graduated from the University of New Hampshire in 1990, with a degree in Community Development, but with an emphasis in the areas of Finance and Business. Over the last twenty years, Tim has served in managerial and ownership roles in various companies, including Managing Partner of Rymark Properties, LLC, President of APG Financial, Inc., and President of Rymark Inc. and Auto Plaza Group, Inc. In these positions, Tim has had the responsibility to oversee and administer all aspects of each such company, including the development of, design, permitting and construction of large, complex business facilities, sales, training and procedural guidelines, and cultivate various business relationships with suppliers, investors, capital sources and legal services. Steve recently joined the Bout Time Pub & Grub team and brings with him extensive experience in restaurant operations, growth and performance. The course of his 30 plus year career has given Steve the unique perspective of having worked in the industry at the not only the management and executive level but as a Franchisee, too. Steve has penchant for brand growth, development and sales success that is rooted in quality assurance, training and organizational performance. As Operations Director, Dan is focused on matters related to marketing, front and back of house operations, quality, franchise support, and ensuring best practices are implemented and routinely verified across the brand. Prior to Bout Time, Dan spent 20 years in hotels, 18 of which working for InterContinental Hotels Group (IHG). While working for IHG, Dan has built and managed partnerships with companies like Capital One, Chase, Points.com, Delta, Hertz, and franchise owners / operators globally. Dan also provided support and direction to international contact support centers and developed marketing programs and initiatives that generated millions of dollars in revenue and above average response rates. When he’s not working, Dan likes to be outdoors; either hiking, beaching, camping, or paddle boarding. Dan has a young son who takes up most of his non-work time. Dan also loves to travel and has visited over 20 countries so far. Crista joined our accounting team in 2013 and brings with her many years of training, sales and book keeping experience. Her responsibilities include all facets of book keeping thru the financial statements for our Utah locations and Franchise Operations. She also prepares year- end tax information and documents. Previous employment as a General Manager, Operations Manager and Area Trainer for a large international retail chain has provided a broad skill set and perspective for her work at Bout Time Pub & Grub. Crista’s spends her off work time with her husband, Tim and 20-year-old twins. She loves to cook, experimenting with new recipes as well as her tried and true favorites and travels to a favorite sailing destination in the British Virgin Islands as often as possible! Megan joined our growing team in 2014 after having worked with Tim for 4 years previously. She brings an in-depth knowledge of all facets of book keeping and office management. Megan’s is responsible for all facets of accounting for our non- franchise Colorado locations including payroll. In addition, she ensures accuracy and timely reporting of franchise and marketing fees collected. Megan spends her off hours with her husband Jeff and their blended family of 8 children. Together they enjoy camping, water sports and cooking. She is also an accomplished author in the field of personal motivation and success. Megan loves Christmas and starts the season every year in October!